Mushrooms are a rich source of nutrients such as vitamin D and B, according to the University of the District of Columbia; 2 1/2 cups count as one daily vegetable serving. Baking mushrooms plain will give them a roasted flavor, and you can add baked mushrooms to another dish or as a topper on meats such a steak. 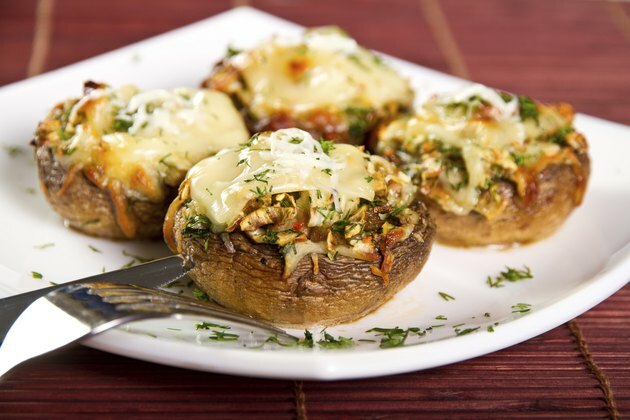 An alternative is to stuff the mushroom caps and serve them as a side dish or appetizer. Wash the mushrooms thoroughly under running water. If stuffing the caps, cut off and dice the stems. Line the mushrooms across a baking pan in a single layer. Do not allow the caps to overlap. Pour olive oil into a saute pan. Cook the mushroom stems until soft and translucent; set aside to cool. Skip this step if you are baking the mushrooms without stuffing them. Combine all of the sharp cheddar cheese and heavy cream, 3 oz. each of the grated Parmesan and bread crumbs and salt and pepper to taste. Add the cooked mushroom stems, and mix until it is uniformly smooth. Place the filling into a pastry bag and stuff the mushroom caps. Skip this step if you are baking the mushrooms without stuffing them. Brush a light coating of oil across the mushroom on the baking pan. Preheat the oven to 375 degrees Fahrenheit and bake the mushrooms until they are brown and crisp on the edges. Remove the pan from the oven and let the mushrooms sit for five minutes. Transfer the mushrooms to a serving dish or add them to another recipe. If stuffing the caps, sprinkle a mixture of the remaining grated Parmesan cheese and bread crumbs over them before baking to enhance the flavor. Be careful when selecting mushrooms at the store. Bruised and damaged caps may affect the flavor of the food.